Chocolate is a delicious cure for a bad day. 9 out of 10 people like chocolate, the 10th person always lies …so quit lying and give this lip smacking martini a try right NOW! 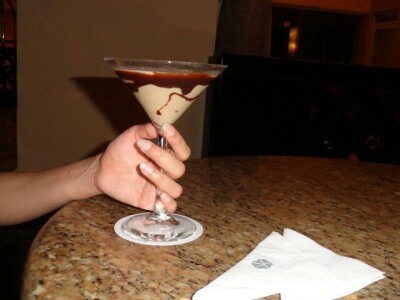 Chocolate martinis are delicious and chocolaty. They are perfect year round but I especially love them during summer. We all need our dose of caffeine but who wants to be sipping on hot coco or coffee in summer ….not me. I tried this drink on my Bday in Cancun & have always wanted to make one myself. They also make a good after meal drink for a romantic date night and are also hugely popular with kids! 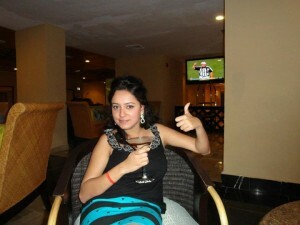 So replace your after meal coffee to chocolate martini! This recipe in non-alcoholic but you can add chocolate liqueur or some other alcohol to add some buzz if you like. When the going gets tough, eat 3.5 oz. dark chocolate. You scream, I scream 5 scoops of vanilla Ice-cream. Don’t cry over spilled milk. Get another full cup of milk. Life is too short to not try 4tbs of chocolate malted milk. Take 1 cup of milk and 3.5 oz of dark chocolate and melt them together in a saucepan. When melted, remove from heat and set aside to cool down a little. Now, blend 5 scoops of ice-cream, 4tbls of malted milk and the melted chocolate mixture you have set aside. We just had one this evening , not home made though ! That looks delicious… I would have to put that in a martini bucket. Shelby, all your chocolate lovers are going to be drooling over it! pack up enough! Daphine! Martini date? lol do give it a try, it is super easy! Sounds delicious Although I would prefer alcohol in it. But this is perfect for kids as well. Jasmine! You can slip in some alcohol too! it will still taste yummy! Have fun trying! I could use one of those right now! Looks delicious! Thanks Samantha! It sure is delicious! Do give it a try! This is amazing! I don’t drink so sometimes it can be hard to find good summer ‘fancy drinks’! Thanks for sharing! Chantal this is perfect any occasion drink! Cheers!